All of us know that the last thing people need during Halloween is another excuse to eat chocolate. But, when you're showing up and sucking all the happiness and hope out of people's minds,giving people a legitimate reason to eat chocolate might be your only redeeming feature. Halloween is all about embracing those creatures that spread fear. What's more frightening than the only creature that could make the great Harry Potter shake in his boots? These powerful creatures bring people back to the worst times in their lives, whether they clearly remember that time or not. They play the part of the worst hypnotist ever. You'd think they would be banished from the wizarding world, but as in our world, there is a place for all beings to exist. The dementors play the role of keeping the worst criminals of the magic world in prison. When there is so much dark power in one place, it helps to keep those genie jailbirds distracted by their disillusionment. It's hard to cast an escape spell when you're bogged down and depressed. 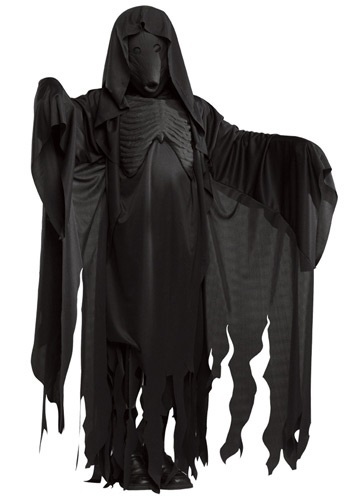 In some twisted way, dressing up as a dementor is like dressing up as a good guy from a nightmare. As every Harry Potter fan has learned, nothing is ever simple. Tell your friends to work on their Patronuses before All Hollow's Eve, they're going to need them when you show up. Don't worry, you won't ruin the party. When you start dancing to that funky beat people will realize you were only a fun loving boggart all along.